The South Terminal officially opened to the public by launching operations on April 13, 2017. 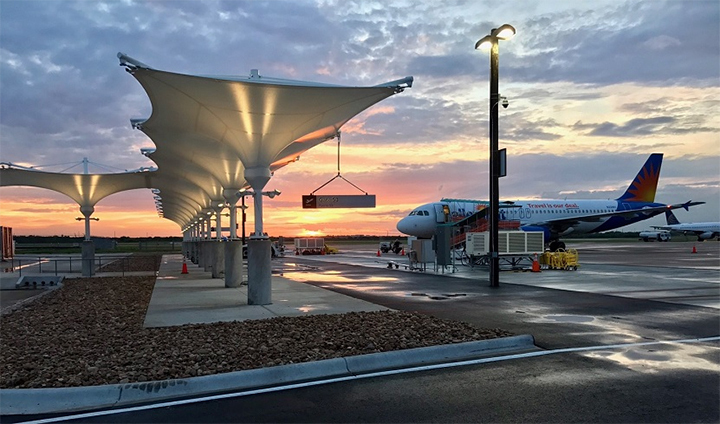 The 30,000 square foot $12 million facility is equipped to service up to 500,000 passengers each year through its three canopy-covered outdoor gates. The South Terminal comes with a vast array of amenities including food trucks and kiosks, an indoor/outdoor waiting area with a live music stage and bar, two TSA security check lines, a drop-off area for taxis and ride share vehicles and shuttle service to the main Barbara Jordan Terminal. The location offers 1,000 covered parking spaces for $7 a day. The facility invokes the nostalgia of mid-century travel, with stylish retro 70s architecture and décor. The design utilizes colors and textures native to Texas Hill Country, providing a one-of-a-kind airport experience reflective of the individuality of the city it serves. LoneStar Airport Holdings, LLC oversaw the renovation project. Allegiant Airlines now calls the new terminal home after moving operations from the original Barbara Jordan Terminal. Allegiant will soon be joined by Sun Country Airlines and ViaAir later in 2017. The South Terminal has a separate entrance on the south side of Austin-Bergstrom International Airport and is not accessible from inside the Barbara Jordan Terminal or from SH 71. The building dates back to the original Bergstrom Air Force Base.